This list was made for those who feel like visiting the city’s most well-known restaurants sounds deadly dull and strolling down the busiest shopping streets seems like drudgery. Here are some ways to get off of the beaten path, blend in with the locals, and become a ”Copenhagen expert”. First and foremost, exploring Copenhagen by bike is a must to be considered an expert. Period. Denmark is flat for the most part, has great infrastructure, and cycle routes all over the country. It has one of the strongest biking cultures worldwide and locals use their beloved two-wheel vehicle to such an extent that Copenhagen now faces a bike-traffic problem. There isn’t even a corner in Copenhagen that can’t be reached by bike, so don’t miss the chance to enjoy endless rides in one of the cities most ideal for cycling. 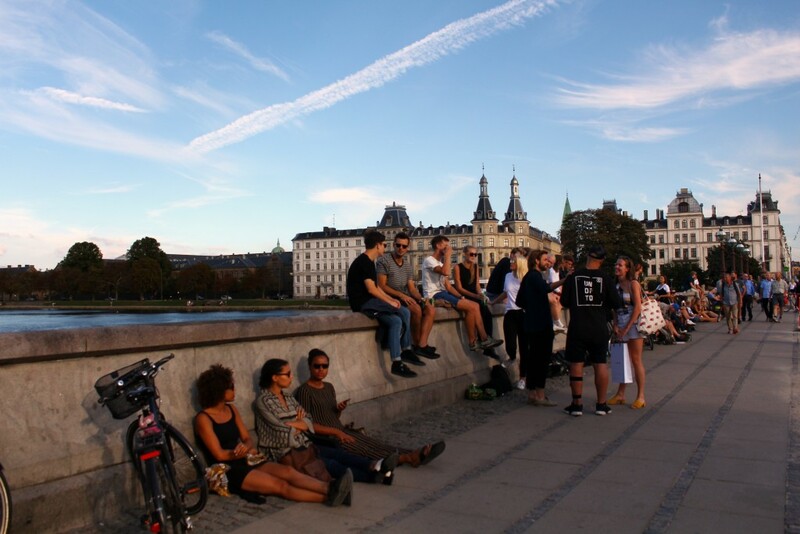 Even though there are many parks all over Copenhagen, many locals choose to hang out at Dronning Louises Bro, the bridge that connects the city center to Nørrebro. Standing between two lakes, the 16th-century bridge is one of the most beautiful spots in the city. On a sunny day, people eat their lunch, enjoy a bottle of sparkling wine, or read accompanied by the sound of music coming either from a street musician or a group of friends rocking a boombox. Copenhagen is like paradise for fashionistas and design lovers. It has many elegant shops selling Scandinavian-design furniture and interior-design items as well as stylish boutiques filled with the collections of Danes and other Scandinavian-fashion designers. However, one of the locals’ favorite habits is hitting the city’s flea markets and vintage shops. Especially during summertime, the city is filled with stands packed with everything from knickknacks and Danish Royal Porcelain to famous-brands clothes and accessories. The Meatpacking District attracts the hippest crowd of the city and has so many different styles of restaurants and bars that everyone will surely find something to suit their taste. From Tommi’s Burger Joint‘s cozy corner to BOB Bistro’s organic menu and NOHO’s ice-chilled cocktails, the trendy district offers plenty of choices for both a relaxed morning walk and a crazy night out. Copenhagen has many cool neighborhoods that brim with bars and nightclubs of all tastes. Experience a night out like a proper local make sure to drink one last beer at one of the city’s bodegas. The smoky bars usually have a jukebox and a fruit machine that add to the places’ offbeat atmosphere. Plus, the drinks are super cheap. Find beer for 20DKK (€2.69) ($3)—for Copenhagen’s standards, this is just about the least expensive option out there. It would be an oversight to not visit Louisiana Museum while visiting Copenhagen. Not only is it one of the most interesting museums in Denmark, its special location by the Øresund Coast offers a great view of the Scandinavian landscape. 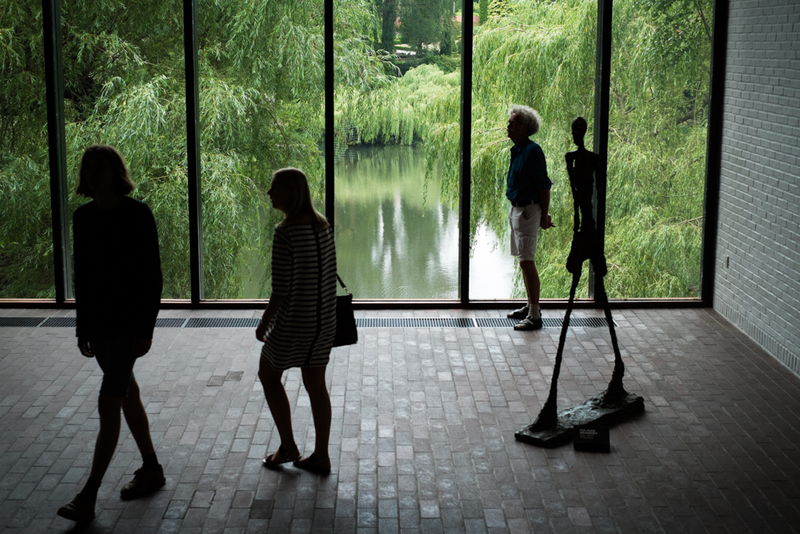 The modern-art museum displays unique artworks by Andy Warhol, Roy Lichtenstein, Pablo Picasso, Wassily Kandinsky, and many Danish-modernist artists. Follow locals’ lead and spend a warm sunny day at one of the city’s blossomed parks with a six pack of beer and a disposable-charcoal barbecue. It’s cheap, fun, and a good chance to soak up some sun. Luckily, Copenhagen has many places to choose from. Some of the locals’ favorite hangouts are Fælledparken, Nørrebroparken, Ørstedsparken, and Frederiksberg Garden. Jægersborggade is a colorful-scenic street in the heart of Nørrebro. It brims with tattoo studios, art galleries, organic restaurants, and cafés. It’s undoubtedly the city’s hip(ster)-crowd favorite. Relæ, the first restaurant that opened in the neighborhood, continues to serve organic delicacies to its customers. For a tasty coffee, check out The Coffee Collective, and Grød is the place for those looking for a healthy breakfast with organic porridge. Tourists won’t have a real taste of Copenhagen’s food without tasting Denmark’s famous pølser (sausages). There are many stands all over the city—especially near Central metro stations such as Nørreport or Christiania—selling fares ranging from the traditional red, boiled-pork sausage (rød pølse) to organic hot dogs. Hot dogs are perhaps the locals’ favorite delicacy, one visitors definitely do not want to miss out on. Blågårdsgade is one of the most picturesque streets in Copenhagen, and it’s widely known for its cozy cafés and bars. The pedestrianized alley is located in Nørrebro and is among locals’ top choices for brunch. Long wooden tables placed along the street are usually packed no matter the time of day. Most bars stay open until midnight, so it’s also a great place for some early drinks. Even though most people are not aware of this fact, Denmark has a long history of jazz music that goes back in the early 20th century. In 1924, the first Danish-jazz record labels were created. Danes still keep the jazz-music scene alive with many concerts and jam sessions taking place in Copenhagen’s jazz bars and music venues. Most of them are located in the city center and fill the streets with magical tunes until late at night. La Fontaine, Hvide Lam, JazzHus Montmartre, and Jazz Cup are some of the most famous. Freetown Christiania is one of the most touristy attractions in Copenhagen. Unfortunately, it has become known for its open cannabis trade that takes place on Pusher Street. However, the hippie district has much more to offer to its visitors. Make sure to stroll around the neighborhoods and rummage at the small shops and stands. Taste the coconut cake from Sunshine Bakery, indulge in a warm coffee at Cafe Månefiskeren, walk around the lake, drink a beer at Woodstock—the neighborhood’s oldest bar—and check out Loppen for concerts. There are many places in Copenhagen serving all kinds of burgers: the traditional burger, with organic meat, gluten-free bread, veggie burgers, and more. But only one offers the original American style burger: the Gasoline Grill. From the day it opened its doors for the first time in April 2016, it became an instant success and burger lovers’ favorite place. 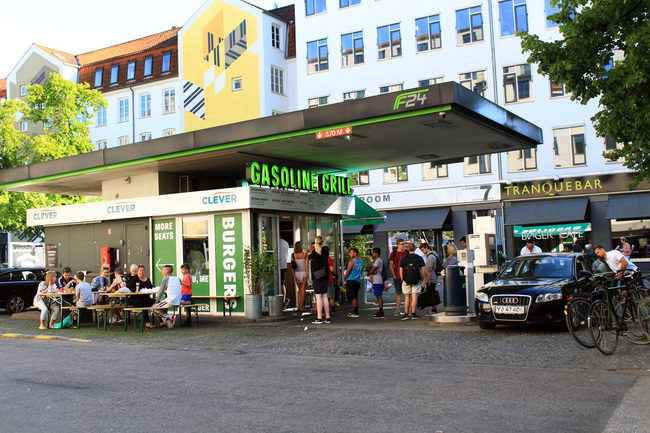 Don’t expect to find a stylish restaurant but a long queue that stretches in front of a gas station instead.